Cheese seasoned with three types of pepper! 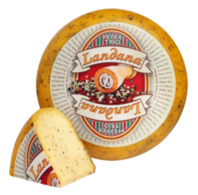 A richly peppered addition to the Landana cheese line. Deliciously seasoned with various types of coarsely ground pepper! Enjoy this specialty cheese on fresh bread or as a party snack!